Not really excited about it. Wish car companies could re-issue/make their old cars. I want to see it in person before I bash its styling too much, but right now its not really doing it for me. I loved the FT1 concept. This resembles some DNA from a RX8 and new Miata cues depending on the angle you are looking from. Not really bringing the proper statement form such a heavy hitting iconic GT car. Performance wise, I don't see it matching the natural trajectory of the last iteration either, with 340hp. Seems to be aiming a little low in the market. But times are changing for sports cars, its hard to know where to place expectations anymore. There is no rule I guess, but what sells. 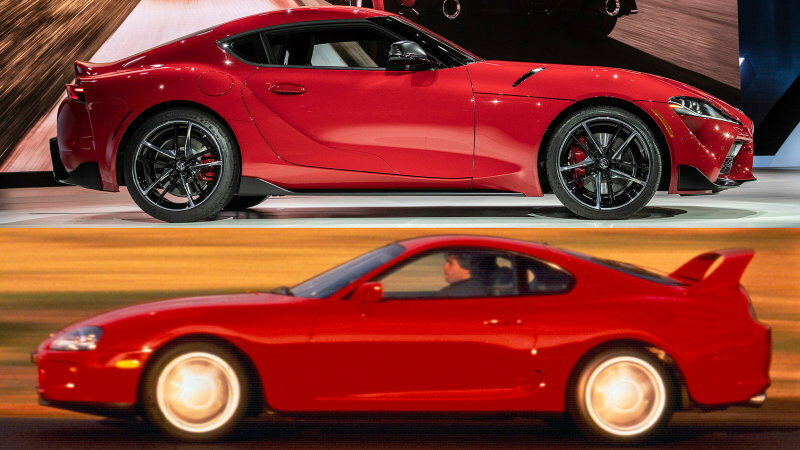 But i'm looking at the cars that were direct competitors to the Supra in the mid niceties and it was a front runner for the Japanese. This supra on paper would be on par with a 10 year old 370z or base Caymen, rather then a 911, Corvette, GTR, NSX etc which is what it used to be more closely competing with performance wise. Last edited by s2000Junky; 01-16-2019 at 11:32 AM. I'm kinda meh on it. -No manual is pretty inexcusable - hopefully comes soon? For only a bit more it would be hard to say no to the excellent M2 Comp ($59k, actually has minimal options), which is also more practical. And if you want a true 2-seater it's hard to look past various new and used iterations of the C7. In all, it's an okay car, but I just would have hoped for more after the gorgeous initial concept and a 27-year wait. I love it! Looks like a Supra but an evolved Supra with good power, it should be a lot fun! Last edited by vicrc; 01-16-2019 at 01:07 PM. Quoted from Tada San the guy responsible for the new Supra, the cut outs for the vents are all functional but for street use they chose to have it blocked off. You can choose to remove it for Motorsport purposes for additional cooling and airflow. I really like it, cant wait to see one in person. Has a good motor too. The BMW 3.0l turbo makes power with such little effort. The same motor in the M240i and that thing with just a downpipe and intake was nuts. Seeing the Supra come back after all this time is awesome. I think Toyota did a good job with styling and I like it more than I thought I would. Yes it could use more power, but as others have stated the B58 can be easily moded to get the 400+ HP that the car deserves. If it drives great then this will be the car to get. Hopefully, a manual comes out but the ZF will be faster all things considered. Hopefully, the rest of the Japanese car companies take notice and bring back some of the other sports cars, Rx7, S2000, MR2. A new MR2 would be cool, but one a little more serious this time, more inline with the natural trajectory of the previous to last gen. Light weight, mid engine rocket. Something in the 2600lb/280-300hp range, wheel base/dimensions near an S2k. Something that has performance level around a Lotus Exige. I know its long in the tooth, but is this worth a $20k premium over a 370Z? A fully loaded new Supra is not far off from a Lexus LC500. I know which one I would want to own and it's not the Supra.